NEW YORK CITY: Times Square Driver Charged With Murder, Cops Believe He'd Smoked Synthetic Marijuana - Joe.My.God. With voices in his head and drugs in his system, a deranged motorist drove his car onto a crowded Times Square sidewalk and mowed down 23 pedestrians — including an 18-year-old Michigan woman who died in front of her little sister. 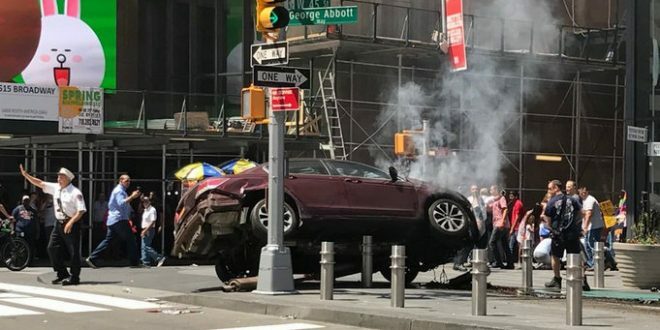 Richard Rojas’ maroon Honda Accord carved a three-block path of destruction along Seventh Ave. just before noon on Thursday. Stunning video shows the car knocking down pedestrians like bowling pins, with bodies tossed through the air from the impact. The crazed motorist, who has two prior DWI arrests, was believed to be high on drugs and wracked by delusional thoughts, sources said. Sources said Rojas told cops something along the lines of, “This was the last day on Earth.” Rojas was charged with murder, 20 counts of attempted murder and five counts of aggravated vehicular homicide late Thursday. Police said the Bronx man who drove his car down a crowded sidewalk in Times Square Thursday was apparently high on synthetic marijuana. Law enforcement sources told WABC in New York that 26-year-old Richard Rojas appeared extremely impaired after the crash. It’s believed he had been smoking the drug, also known as K2, prior to the crash that killed a tourist and injured 22 others. Initial tests have come back negative for alcohol, but positive for drugs. Blood tests are underway to check for the presence of synthetic marijuana or PCP among other substances. Rojas enlisted in the Navy in 2011 and was an electrician’s mate fireman apprentice. In 2012 he served aboard the U.S.S. Carney, a destroyer. Navy records show that in 2013 he spent two months at a naval brig in Charleston, South Carolina. They don’t indicate why. Rojas was based at the Naval Air Station in Jacksonville, Florida, before being discharged in 2014 as the result of a special court martial, a Navy official said. Details were not immediately available.